The Village of Hoosick Falls is located in the Town of Hoosick, a rural community located in northeastern Rensselaer County. The Town has a population of 6,700 with 3600 living in the Village. The town residents outside the village reside in one of its seven hamlets of Buskirk, Eagle Bridge, Hoosick, North Hoosick, Potter Hill, Walloomsac, and West Hoosick, or in its more rural areas. The town has a mix of farms and light industries. One of the area's greatest resources is its scenic beauty. Rolling hills, mountains, and the two rivers—the Walloomsac and the Hoosic—which wind throughout the area, provide visitors and residents alike with breathtaking views and tranquil, private spots to enjoy the simple country pleasures of hiking, canoeing, or picnicking, and of course—spectacular trout fishing. In the Village of Hoosick Falls, the tree-lined streets with their graceful, Victorian dwellings retain much of the character and charm of the turn of the century. And summer concerts by the community band in Wood's Park still remind people why Norman Rockwell and Grandma Moses took inspiration from the area and it's people. 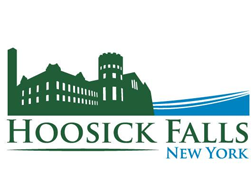 Hoosick Falls is located close to the many ski resorts and the many lakes of the Capital-Saratoga District, the Adirondacks, the Berkshire Hills of Western Massachusetts, and nearby Vermont. As part of the Capital District, Hoosick is near its shopping centers and is fifty minutes from the State Capitol. In visiting or living in the town, one can take advantage of its antique shops and two auction houses, the community pool or skating rink, and the "Old Time" band concerts in the Park. Or one can play golf on the nine hole course located within the village. Hoosick also has two fine school systems, Hoosick Falls Central School, and St. Mary's Academy, a Roman Catholic elementary School. The Town of Hoosick is an active community with great community spirit. Besides its many religious, social and community clubs and organizations, it's village and hamlets have volunteer fire departments and the town has an active rescue squad that provides 24 hour emergency service to the sick and injured of the community. The Hoosick Falls Health Center, a non profit 41 - bed skilled nursing facility, serves the town and surrounding areas. For current and archived newsworthy items in the Village, check out the news page. For upcomming happenings and events, check out the event page.